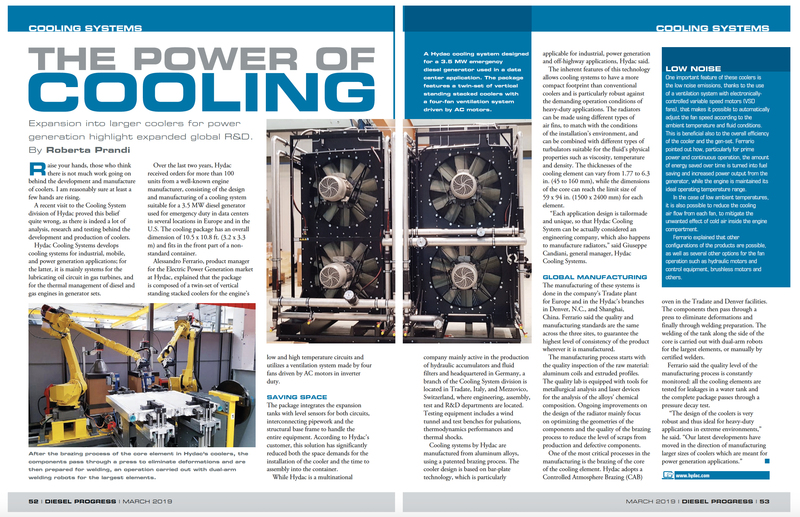 Expansion into larger coolers for power generation highlight expanded global R&D. Raise your hands, those who think there is not much work going on behind the development and manufacture of coolers. I am reasonably sure at least a few hands are rising. A recent visit to the Cooling System division of Hydac proved this belief quite wrong, as there is indeed a lot of analysis, research and testing behind the development and production of coolers. HYDAC Cooling Systems develops cooling systems for industrial, mobile, and power generation applications; for the latter, it is mainly systems for the lubricating oil circuit in gas turbines, and for the thermal management of diesel and gas engines in generator sets. Over the last two years, HYDAC received orders for more than 100 units from a well-known engine manufacturer, consisting of the design and manufacturing of a cooling system suitable for a 3.5 MW diesel generator used for emergency duty in data centers in several locations in Europe and in the U.S. The cooling package has an overall dimension of 10.5 x 10.8 ft. (3.2 x 3.3 m) and fits in the front part of a non- standard container. Alessandro Ferrario, product manager for the Electric Power Generation market at HYDAC , explained that the package is composed of a twin-set of vertical standing stacked coolers for the engine’s low and high temperature circuits and utilizes a ventilation system made by four fans driven by AC motors in inverter duty. Click the image and read the full article!